We LOVE hearing YOUR STORY of HEALING and we are always blessed and encourage to read of the many ways God has worked in your life! If you would like to share your story, please CLICK HERE! 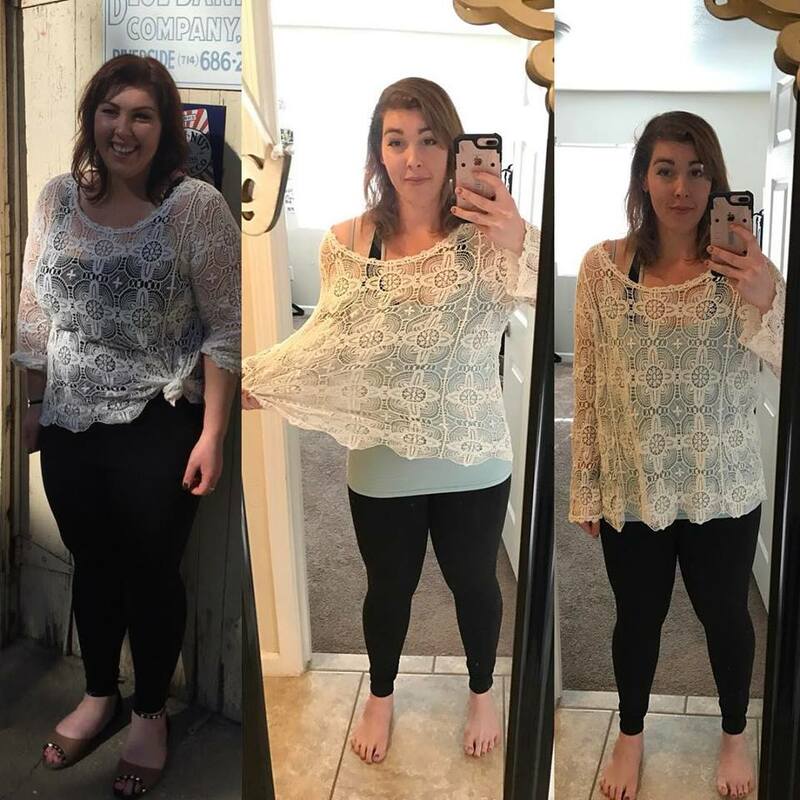 I started a wight loss journey a while back and did lose weight but it wasn't very easy! I worked out hard! I was doing diets and what not! But Until I found out I had candida over growth as well as a crashed thyroid that needed supplements on top of other things. And I grew up eating healthy! My mom is the best when it comes to healthy meals! But I did struggle with over eating I have a and still do from time to time.) I had a craving for sugar! But until I made a change in my heart it became easier to lose the weight and to heal my body! With the help of supplements, and getting the candida over growth until control wonderful friends and family that helped me stay motivated but most importantly putting God above all and not worrying about the weight loss that's when it became much more easier! And I have noticed now as I ended up hitting one of my goals I can honestly say it still not isn't always easy. there are times when it gets hard where I don't eat perfect, but I do my best! And give it all over to God. And know that Im already made perfect in God and I don't need to worry or obsesses over my weight! I have been gluten free, grain free, dairy free, caffeine free, and sugar free (including fruit) for 35 days now. Healing autoimmune disease is a process, and NONE of this has been a result of willpower. Every bit of these 35 days has been grace. There is no "Yay, me!" here. The last time I tried a paleo diet saw lack and disappointment everywhere I looked. I wasn't ready to allow grace to carry me. Isn't it amazing that we often need to reach the end of our proverbial ropes before we'll accept it? An exciting part of seeing my health being restored is noticing that I am falling asleep easily, earlier, and sleeping through the night. I actually have dreams when I sleep. That hasn't happened in YEARS! I was able to stop taking thyroid meds (after 2 decades!) and those "last ten pounds" are almost gone. But most importantly my eyes are open to the healing properties of food and herbs, God-made stuff, and the abundance of grace poured into a situation when you respond to a prompting of the Spirit. If I'm being perfectly honest, I must admit that although heavily sustained by God's promise of wellness, this diet has not been absent of overwhelming frustration and inner tantrums raging against denial. It's been a long road. But what I'm learning as I journey this path is that I've allowed what is "good for me" to be defined by the things that give me momentary pleasure, not the things that in perseverance and diligence create abundant life. It's perspective. My agitation at not being able to indulge in the things that were causing my body to destroy itself is due to the false notion that I am being denied "good things". That is a lie, as I am currently being ushered into a state of health I've never known. Friends, the Israelite's wanted to go back to Egypt when the food got boring. The promised land lay ahead and they didn't want to press on because they saw what was in front of them as distasteful and bland. Let me urge and encourage you to reevaluate your idea of "good" and assure you that if God is walking with you, and led you this far, you are receiving HIS goodness. It is worth choosing meekness over allowing yourself to be talked out of greater freedom. He is faithful in delivering His promises. Don't let discouragement be a distraction to your heart. 3. It won't work for me?! Jana — Your passion, story and willingness to tell it warms my heart. I don't mean to sound patronizing in any way, but I am SO PROUD OF YOU!! - Suzanne B. Love your testimony, a 21st century Abraham! Love your class too, what a blessing! So the last time we met, I had been on the Candida Clear for just under two weeks, and following my supplement plan for a week longer than that…my biggest improvement at that point was my excessively sweaty hands and feet…stopped sweating!! Can hardly believe it, I have been like that as long as I can remember, and thought I was just genetically wired to sweat more…thank you so much for showing me a new normal! A week ago I stopped taking the pill! I had missed taking one, so I did like I normally do and took two the next night…I woke up in the middle of the night with terrible cramps (which I never get), and was spotting the next day…I took it as a sign that maybe my body was rejecting it…so I stopped. So far I feel great, I had a normal period; but am a little scared just because of my past experiences; I’m trying to walk in faith, I don’t have any back up pills to take if things get rough. I have to trust that the Lord is healing me. Please pray for me…This is huge, and I so want to be off of them for good, and have another new normal! Just wanted to share my results after 1 week of no gluten, dairy or sugar. I lost 4 pds, my brain is more clear, have more energy and have HOPE. Its much easier than I thought because I don’t crave carbs or sugar since I don’t eat them. Thank YOU! I finally get the stitches out of my hand tomorrow. I used two bottles of Silver and wrapped the wound site with raw honey and garlic to stop the infection. So far so good! Knowledge is power. Thank you for all your help. Bless you my dear Doctor. I. Love. You. And…. I esteem you. I have a six year old son, named Ben, who I brought to Dr. Jana a few months ago. About 9 months prior to his visit, the skin on his toes had begun to peel. At times it would be bad enough that they would burn and itch. I tried putting different topical lotions and creams on his feet and changed his shoes so his toes got more air. Nothing seemed to help. About 3 months later, the skin on his fingers and hands began to peel. It continued to worsen until there were patches of raw, inflamed, skin on his hands and fingers. It was then that I decided to take him to see Dr. Jana. With just two supplements and some dietary changes, his skin healed almost overnight. After one week the peeling stopped, and the inflammation had significantly decreased. After two weeks, it was gone. It was remarkable and such a blessing! I can’t say enough about how grateful I am to have found Dr. Jana. My son loves going to see her because she doesn’t do any of the “scary” things some doctors do, and I appreciate her tender warm approach toward him. She is truly a compassionate healer who desires to help people become whole. I recommend her without reservation. I was exhausted emotionally, resolved that I would spend the rest of my life treating the symptoms of my IBS but never curing it; hopeful, but not totally convinced that I would ever feel energetic again, and surrendered to my circumstances as beyond my control. I do not believe in coincidence, so I know it was not by mistake that I attended a Health Party where Dr. Jana was the guest speaker. That party was the turning point in my struggle with IBS. Believe me, you do not want to know the gory details, but since becoming a patient of Dr. Jana’s, my IBS symptoms are improving week by week and I am on track to regain my health. For me, it has been a sometimes frustrating process because I was such a mess. However, even after just a few days of starting the “12 Weeks to Wellness” plan I was sleeping better, had more energy, and began to feel better overall. That alone gives me the determination to stay with the plan and not give up. Dr. Jana and Lori are a constant source of support and encouragement when I struggle with setbacks. They answer my never-ending questions about “why,” without a second of hesitation and always in a positive manner, influencing me to be positive too. Now, after only 8 weeks of being under Dr. Jana’s care I feel better than I have in years, and am excited about my future without IBS! I am convinced that Dr. Jana’s lifestyle plan is for everyone, regardless of your medical condition – what are you waiting for? It was a pleasure meeting you at the Ladies Who Launch meeting. Thank you for hosting your “Health Party”…I appreciated the information, good food, email cookbook, but most of all Dr. Jana’s sweet and humble spirit as well as, not being afraid to tell others that faith in God, is a very important ingredient to good health. Having Jesus Christ in ones life is the FOUNDATION to restore healing in the inner man/woman and best of all it’s everlasting!! So much to say on that subject, but perhaps another time. I look forward to using my coupon you blessed me with and having a good time of fellowship when I come in for my appointment. ~ B Vibrant, Brenda O. “I was around 6 ½ months pregnant with baby #2 when I began seeing Dr. Jana for consistent chiropractic care. I had been having a LOT more aches and pains this second pregnancy than I did with my first. I had constant pain in my lower back, no doubt from the extra weight of my growing baby, which was also aggravating lower back issues that I never completely dealt with after a fall down the stairs several years ago. I knew that I needed some adjustments soon if I was going to make it through my remaining 3 months of pregnancy feeling good! It was my pleasure to meet Dr. Jana, who is very personable, friendly, and extremely knowledgeable in her field. She was so helpful in explaining and re-explaining the how’s and why’s of the chiropractic adjustments she would be doing. None of the adjustments were harsh and I never felt like my baby was bothered by the adjustments. After about 3 weeks of seeing Dr. Jana 2 times a week, my pain level had drastically reduced. My pain level had gone from a consistent pain level of 7 or 8, to an intermittent pain level of 3-4. And now when I do experience pain in my lower back, it is always because I have over-extended myself and tried to lift things that were too heavy for me. The difference now is instead of staying with that pain after I hurt myself, I know I will receive almost instant relief after my next chiropractic appointment. I would highly recommend Dr. Jana to any of my friends or family! I just want to thank you, from the bottom of my heart, for giving me my life back. I was diagnosed with Rheumatoid Arthritis about 15 years ago when I was in my early 30’s. Since then, I have been on several prescription drugs, had a wrist fusion and was considering taking injections of a biologic agent because the other drugs were no longer working. Not only was I dealing with the RA pain but also with fatigue, depression, weight gain, and a feeling of hopelessness. I had resigned myself to the fact that this was how I would feel for the rest of my life – not really living just existing. Then, one day I was talking to a co-worker (Debbie) about her weight loss and she shared her story with me and how you had turned her life around. She had suffered from back pain since she was a young girl and was happy to tell me that after a few months with you, she was a different person. So, I thought if you could help her, just maybe you could help me, too. What an understatement! Dr. Jana, you have transformed me and in a short amount of time. I feel like I did 15 years ago. I have lost weight, my skin looks clear, my eyes sparkle again but the best part is that I no longer take any prescription drugs for my RA. How liberating it was to throw all of those pill bottles away! Thank you seems so inadequate for all you have done for me and my family! I so appreciate your willingness and enthusiasm to help others. Thank you for your willingness to let God use you in such a special and powerful way. This is Mark and I am Shay’s husband. I wanted to take a moment and give you a big thank you for listening and helping Shay with her eczema. As I’m sure you have seen what the BioEssence is doing. After all the treatments and creams and drugs she has been through this has definitely been a breath of fresh air. I told her that she needs to be a spokesperson for this. I am so glad that Chris gave me your information here at the office and I gave it to Shay. I told her that her passion for helping other be healthy ought to correlate with what she does on a daily basis. Her testimony and story is a walking billboard for the holistic approach to health. I really hope you will consider working with her in some form. Her passion and knowledge for what you teach will help your business and help others that are dealing with the many health issues that are out there. I just wanted to say thank you from the bottom of my heart and continue the great success. I have learned that medicating the problem really doesn’t work all that well. I have always been a skeptic of drugs and now I have my proof. Thank You! Thank You! Thank You! I am a 5 feet tall, 70 year old, small frame female. I had been a very active person all my life. In 1990, I started developing arthritis. As time went on, it got harder and harder to walk without a lot of pain. After being diagnosed with osteoarthritis, I underwent Bilateral (double) Hip Replacement in December, 2007. Before and after the surgery, I gained up to 168 lbs., size 14, and blood pressure was elevating sometimes to 210/110. Even after the surgery, I still felt and looked sick. Finally, in March, 2009 after a lot of therapy, chiropratic care, and aqua therapy it was more comfortable for me to walk, but only about 1/4 mile in twenty minutes. I have had allergies for years that almost drove me and my family crazy. I came to Tennessee for my first visit with Dr. Jana September 2, 2009. After just two months, with her adjustments, treatments and her wellness program for me, my BP is now normal without medication, I have lost 30 lbs., 8 inches around my stomach, my allergies are 95% relieved, and I am now walking a mile in 30 minutes and sometimes an hour and half duration with no pain. I feel better and look younger than I have in almost 10 years and am wearing clothes (sizes 8 and 10’s) that I haven’t been able to wear in years! With Dr. Jana’s guide, it takes commitment, determination, discipline and conscientious decisions on your part to make food combinations interesting and to make your goals reachable. I have forgot how difficult it was before just surviving thru the day. But thanks to you we can enjoy living life now. I really don’t know what we would do without you. So thank you very much for everything! I met Dr. Jana completely by accident. Our introduction is now clearly a miracle from God and, once again, causes me to marvel at the power of prayer. I am a 62 year old woman. The first half of my life was blessed with extremely good health and energy. Taking that for granted after the age of 20, I lived dangerously, abused drugs and alcohol, smoked, suffered from depression and never exercised. I did experience some extended periods of improvement, but now I suffered from Hepatitis C, continuous infections of every variety, long term depression and weight gain, hypothyroidism, debilitating arthritis and stenosis in my lower back. Then on July 4, 2010, due to a serious intestinal infection, I blacked out and drove my car off the freeway, breaking my back in 4 places. My health was spiraling and my clock was ticking as I consumed large doses of pain medication, laxatives, sleeping aides and synthetic thyroid medication bringing with them gnarly rashes and severe side effects. I was practically housebound and always nauseated. The doctors had a pill for every ailment but absolutely no answers for improvement. Dr. Jana had answers. Two weeks into Dr. Jana’s treatment, I had a back molar become infected and my face began to swell. I don’t have to describe the pain. I was terrified to reverse my new path with an antibiotic. In her sweet way, Dr. Jana insisted I try Silver Shield rather than an antibiotic and although I remained skeptical, within two days, the tooth pain was completely gone and the swelling was well on it’s way down and has never come back. I have since cut my pain medication in half, and no longer need laxatives. Most surprising is my willingness to be patient and sometimes uncomfortable to experience the health I crave. I am so grateful for that day that I met Dr. Jana. Her passion, her expertise, and her commitment to the Lord are a daily testimony to me. Thank you from the bottom of my heart. Thank you so much for everything! I’ve been really inspired to start treating my body like its the temple of God. I’m thinking twice of what I eat:) I love eating healthy thanks for all the tips:) I really appreciate everything you’re doing! I have wanted to email you a few times, but just figured hiding would remain the safe way to go. So, today I come out of hiding …It has been a daily struggle in which I have felt alone, and that others just don’t understand. I see the stares, get the ‘up and down’ look with the underlining tone of it’s her fault she so gross etc. And I just wanted you to know that your status updates have been one of the most encouraging things that have continued to help me fight! I have started juicing and am almost completely wheat free, I feel amazing. The biggest battle is in the mind and knowing the fact that it’s no one else’s battle but mine, but I know I’m not alone because I have an amazing Father who is right there! I feel like the child the parent watches as they struggle to help them walk, first they will hold their hands, then they let go but stand right there to catch them, and then comes the inevitable they must stand back and watch as they climb, walk, and fall with no help but still there to comfort the boo boos and scrapes but knowing they’ve got to stand back as the child begins to learn to do it afraid, do it alone, but they never leave them. The comfort I have through the process is the non-stop running that comes next and no gate can corral me or hold me, because I am truly a child of the one true King, and I can approach the throne boldly….Can’t wait to take off running! Thank you for posting what you do, you have deeply impacted my life and heart. So thankful for you and your transparency and just your no fear love for the Lord. Keep running! Folks are paying attention and are getting just as hyped up to start running on their own because they see what happens when God is always involved! Love you lady! Thank you for being you and being obedient! I just read through your Lifestyle Guide- what a fantastic resource, so concise and thorough, you covered everything! Well done my friend! You are gifted in so many areas. I’m truly inspired by your faithfulness and fearlessness to your call. It’s so fun to finally meet a friend, sis in Christ that shares my same passion for health, nutrition and fitness. Thank you for taking the time to send this to me and for putting together my Action Plan! I’m so excited to beat this Candida Beast. I’d been having a ‘flickering’ problem with my eyes for years and never really thought anything of it. Until it started to get worse. It was sort of like being in a strobe light and having no control over my eyes. It would occur with large distractions in my peripheral vision while I was driving. They terrified me, I thought I was having seizures in my eyes. I was avoiding going to a conventional doctor because I don’t have endless money or the patients for them to tell me that they could only blindly prescribe me and run random tests. I explained my problem to my co-worker, Tom, who had recommended Jana to me a few months before about my back pain and recommended her again for my eye problem. I mentioned it to Jana at my next adjustment, she did some little tests. It turned out to be a build up of heavy metals and chemicals and sent me home with two vitamins twice a day. I kid you not, within just a couple of weeks I noticed a tremendous difference in the ‘flickering’ and about a month later none at all! That’s not really something that I would have thought that she could help me with and here she cured me in a month. It was amazing! Thank you for everything you do! Highly recommended! She will change your life! In April, 2011 I was set to have gallbladder surgery to have my gallbladder removed due to some serious nausea and tummy issues I’ve had since I was a teenager. However, my very discerning husband felt we should postpone it to try a more holistic option. We were a little unsure because it is so hard to find a good natural/holistic doctor that isn’t wrapped up in beliefs with which I don’t agree. However, in May 2011 God opened up the doors for me to go to Dr. Jana Joshu-Grimm, a Christian holistic doctor. I have been feeling better and better every day since then. She was able to determine the real root of my gallbladder and tummy issues-it was my adrenal gland. Now my body is getting healthier, my adrenal glands are actually functioning at 100% (instead of not at all), and I am trying all kinds of yummy new foods that I otherwise never would have tried. Can I just say I am loving a hamburger patty with salsa, avocado and goat cheese?! So I just want to take a minute to say GOD IS GOOD!!! Now I had prayed A LOT over the years for God to heal me…but He didn’t…at least not how I was praying for Him to do. I was wanting an instant healing, but instead He sent me someone to instruct me on how to care for this temple of the Holy Spirit and how to be truly disciplined with this lifestyle change. I still have a few months to go to get my body back to where it needs to be; and a lifetime of healthy eating and exercise. Sometimes it’s hard (even with my wonderful hubby who is super supportive and eats everything I put in front of him) and sometimes it’s easy-but in the end, it is worth it. I want to be on this earth for as many years as possible so that I can be used to reach as many people as possible and fulfill the purpose that I am here to complete.